The Ladies' Guide to Surviving Anypocalypse: Eh, it is what it is, you know? For example, the adage "it is what it is" (or, in musical format, "que sera sera/whatever will be will be") drives me bananas. Regardless of the language or the aptitude of the singer, I hate this phrase. It essentially means that whether a person wants something to happen or not, it will happen. Of course some events are out of our control (e.g. - apes becoming sentient and transforming into Apes; rodeo clowns from outer space kidnapping humans to use as Los Toros in intergalactic bull fights ), but that does not mean we cannot control anything that happens. It does not mean that we cannot improve our circumstances. My loathing of those two statements, and others like them, springs from them being devoid of Hope. Being a Survivor isn't just about surviving. Aplomb helps, of course, but adding it to surviving does not make one a Survivor. We don't give up Hope. The only way to break one's chains and improve one's situation is to believe change is possible. Without Hope, belief is impossible, change is impossible. For a moment, turn you eyes backward. 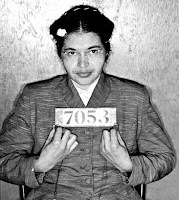 Look at Rosa Parks. Sure, she was a tired woman on a bus but if she didn't have Hope (and, admittedly, a wide and varied network of friends) she would have just gotten up and stood like the bus driver told her to. Segregation, at the time, was what it was. Had Parks not agreed to fight, had people not known her and been willing to forgo using the bus system, had Parks said, "It is what it is," it might still be that way. From the time Susan B. Anthony was a girl, she had Hope for the future and strove to make it better than her present. She fought against slavery. She was one of the founders the Women's Temperance Movement. 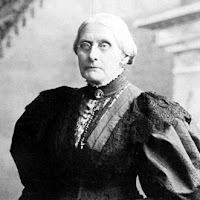 She voted in the 1872 Presidential Election and, consequently, was arrested. Had Anthony not had Hope and belief in change, she would not have challenged the politics of the time. She would not have championed for women's suffrage. I try not to cringe when I hear people say, "It is what it is." I want to tell them that things will get better, that this too shall pass, that if they try and believe and hope, they can change what is into what ought to be. I would like everyone - man, woman, and child - to strike hopeless phrases from their lives. We should all believe that just because the present is doesn't mean it should be. To the Apes and the Intergalactic Rodeo Clowns and to other Oppressors, Hope is dangerous because people who have Hope and Dreams are capable of Actions. Most people use "it is what it is" as an excuse to do nothing. So, I agree, let's do away with this phrase!! One of the major reasons I hate that phrase is that it implies that the person saying can't do anything, so why bother trying. Strike it from our collective vocabulary!